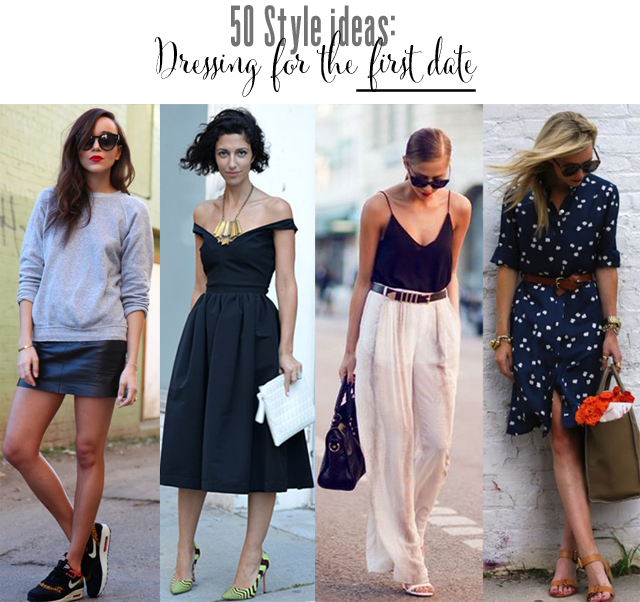 50 ideas: What to wear on a first date? The first date "what to wear" question. It's the bane of my existence, and yours as well, it would seem. I've had so many emails over the years asking for advice on what to wear on a first date. Women have said they want to look natural or like they aren't too high maintenance. Basically everyone wants to look their best, but not like they spent 48 hours figuring out what exactly to wear. Ladies, the cat's out of the bag - men know. They know, and I think they secretly like it. Who wouldn't love the idea of a woman wanting to make the best first date impression? There's no shame in taking time to plan an ensemble. However, it shouldn't be a painful experience. This leads us all to where we sit today. I've taking some time to put together a sort of encyclopedia of recommended ensembles for first dates (with notes). I figured the easiest way to do this would be to put together a Pinterest board and give you 50... yes, 50.... ideas to work with. There's a little something here for everyone, from jeans and t-shirts to leather minis. Basically, it's a springboard for first date style. I tried to use wardrobe basics as much as I could so you look at your closet and replicate with items you already own. Saying that, in the summer, I feel nothing is better on a first date than a brand new beautiful summer dress. But, there's that and more to be discovered on the board. If I may just impart this one little piece of wisdom. Some of the best first dates I've had, after 20 years in the game, are the ones where I wasn't prepared at all and had very little time to change, if at all. You'll most likely always remember what you wore, especially if it's a date to remember, but really it will be all about who you are sitting there with. So just remember to show up smelling great with a big smile on your face- most important things. If the chemistry is there, it's there. The right skirt won't change that much. Follow Fashion Foie Gras's board First Date Style on Pinterest.